After a two-week break, I teed it up at the Fairways Golf Club for my 10th round of the season. I had only hit golf balls once during the break and I expected a little bit of rust when the round began. 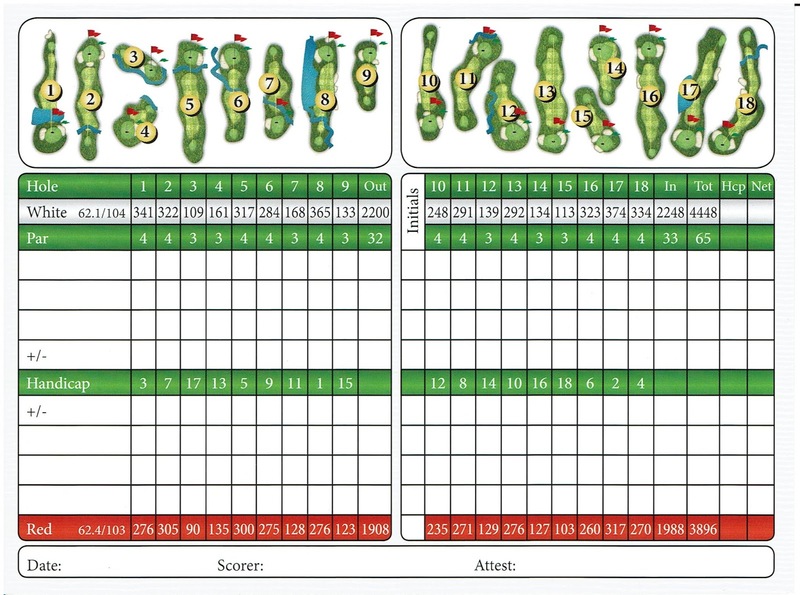 After parring the First Hole, I played some consistent golf, but couldn't quite put another par on the scorecard through the rest of the front nine. My putting wasn't sharp and I turned pars into bogeys and bogey's into doubles. I made the turn in 45. The back nine started much like the front, with a par at the short Par 4 Tenth Hole. But I was able to keep it going a bit better on the back nine, even with some trouble hitting my tee shots. 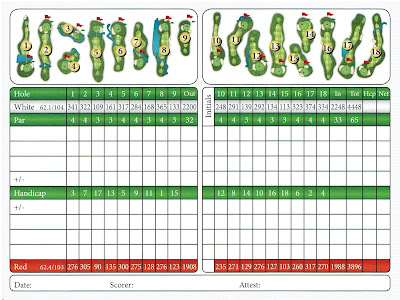 I made additional pars at the Thirteenth, Fifteenth and Sixteenth Holes. I would have had a couple of more pars if my putting had cooperated. A back nine 40 gave me a score of 85 for the round, and while satisfying--I didn't make a score higher than 6 on a hole--I know my score could have been even lower. I had a few equipment changes for the round, some permanent and some as a trial. I will detail those changes in separate future posts. In the meantime, I am working on setting up a round for this coming weekend at a course that I haven't played in a few years. Hopefully, I can get it scheduled. After playing eight rounds of golf over seven consecutive weeks, I took off past two weeks due to other planned events and inclement weather. But today, I did work in a practice session at the Mad Golfer Golf Club. After warming up by hitting 15 balls with my sand wedge, 6-iron and 3-wood, I employed a method called "random practice," in which you vary what you are attempting to do from shot-to-shot. In today's random practice session, I hit golf balls as if I were playing Fairways Golf Club. For example, I hit a ball with my Driver, just as I would on the First Hole at the Fairways. I then judged what I likely would have remaining for my approach and hit the appropriate club to a target that distance. Today, that was a 7-iron. If I judged myself to have missed the green with my approach shot, I then hit a chip or pitch to a marker the distance I felt I would have been from the cup. The only part missing was putting. After using the random practice to play the 18 holes at Fairways Golf Club, I finished off my practice by working on my long irons and fairway woods. 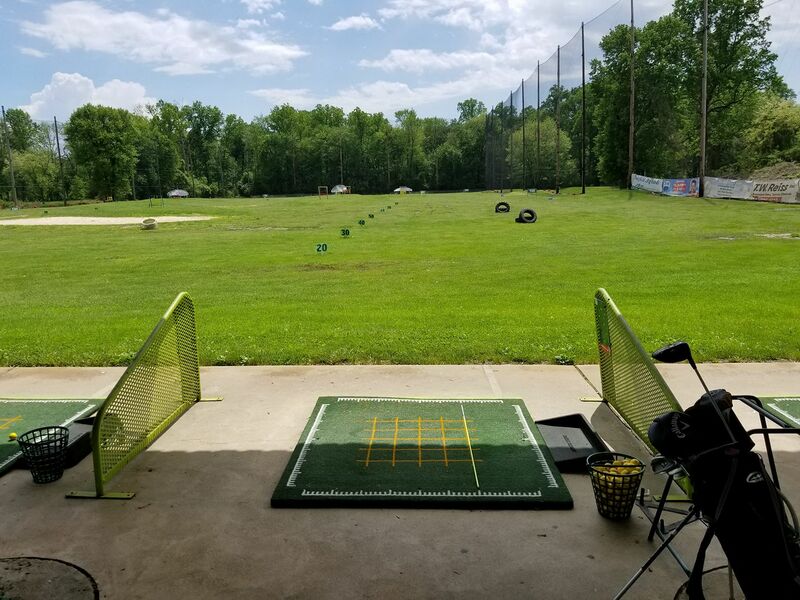 I hit 12 4-irons, 15 5-woods--both off the tee and off the mat, and 14 3-woods. This practice has hopefully set me up for another stretch of golf, which I hope will carry me through the week of Labor Day in early September. Visiting the Delaware shore for a family reunion provided the perfect opportunity for a round of golf with a few of my cousins. 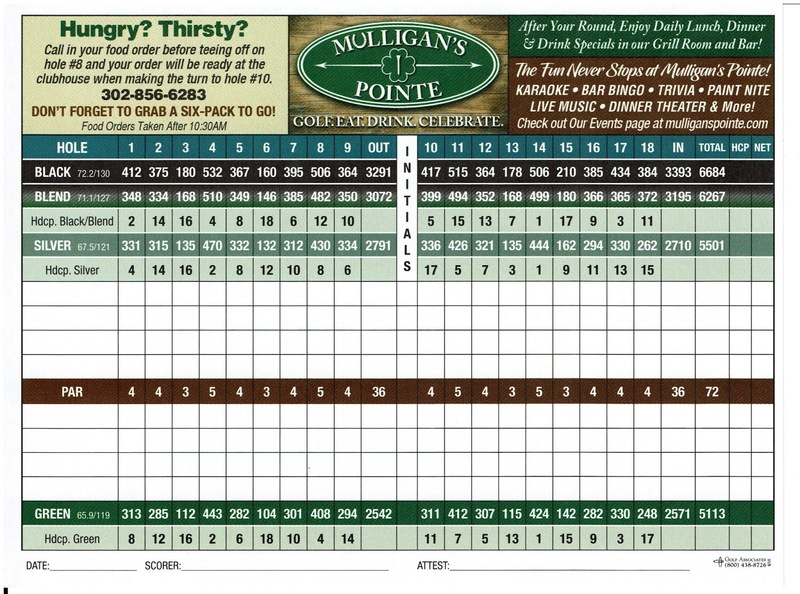 Looking for someplace new to play, I found Mulligan's Pointe in Georgetown. 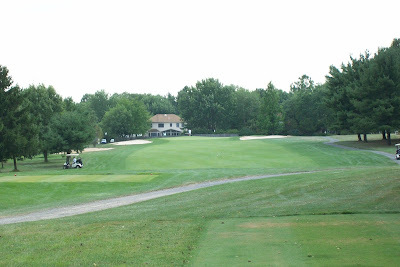 Formerly Sussex Pines, a private country club, Mulligan's Pointe opened to the public for play earlier this year. With a newly remodeled clubhouse, Mulligan's Pointe still has the look and feel of a private, "member's only" club, but with green's fees of $40 including cart, it is definitely public-friendly. It was evident the new owners are putting money into restoring the course and facilities. The course still needs some work, but overall, it was a bargain compared to surrounding courses. Coming off last week's heat wave, temperatures only reached the upper 70s on Sunday when we played, and a gusty breeze made it feel more like September than early July. Except for the breeze, which made hitting some shots rather difficult, it was pleasant conditions for a round. The breezy conditions certainly didn't help me deal with a course that was already a bit of a beast. It is nearly 6300 yards in length and there is water on numerous holes, just waiting to drown wayward shots. My game has not been at its best the past few weeks and Mulligan's Pointe wasn't the place it was going to reappear. I had trouble off the tee, and when I did hit a good drive, I often had a very long approach shot into the green. My short game was fair, but my putting was really poor. So poor in fact that I played the last three holes putting cross-handed. 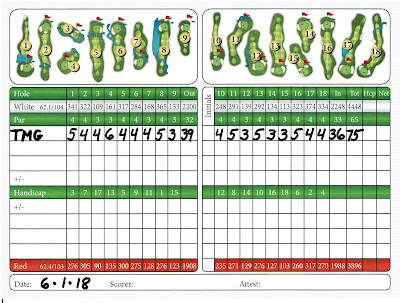 While I never made worse than an eight during the round, I had three of them, along with three sevens and six sixes. In fact, I only made one par, at the 180-yard par 3 Third Hole, during my round. I think it was a combination of my game being off, breezy conditions and unfamiliarity with the course. 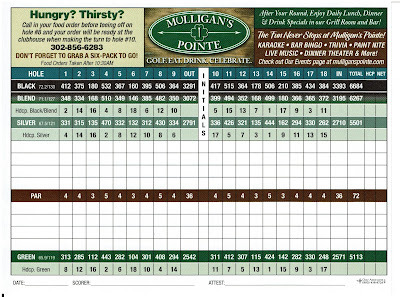 Needless to say, I was a bit disappointed with my round at Mulligan's Pointe, but I can't get discouraged. I will work to get my game back to where it was earlier this year. And by the time September gets here and we head back to the Delaware shore for vacation, I will be ready for a mulligan at Mulligan's Pointe! * Play a minimum of 20 rounds in 2018. As of June 30th, I nearly halfway to achieving the this goal. To date, I have played eight rounds and have another scheduled for July 8th. The raining weather through most of spring delayed the start of the season, so I am playing a bit of catch-up, but I feel I can meet this goal. * Have a minimum of 10 practice sessions during the 2018 season. Because of the rainy spring, I practiced more than normal because I wasn't able to play on a course. So far, I have had five practices at the range and putting green, leaving me halfway to fulfilling my goal. * Play at least two now courses in 2018. While my eight rounds so far this season have been played over five different courses, I have yet to play a new course this year. That should change this weekend when I play my inaugural round at Mulligan's Pointe in Georgetown, Delaware. * Start my golf season no later than April. While I didn't play my first round of the season until May 1st, I did have two practice sessions in April to prepare, so I consider this goal achieved. Cold and rainy weather into late spring also played a role in delaying my first round until May. * Maintain a focus on course management and playing all of my rounds under 100 throughout the season. 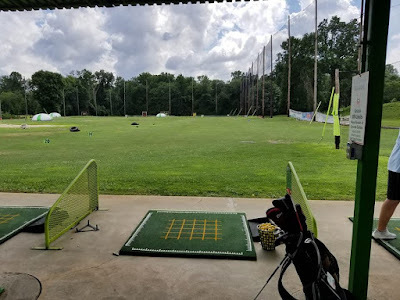 I did well with goal through the first six rounds of the season, but I severely lost my focus, as well as my emotions, during the seventh round and shot 100 at the Fairways Golf Club on June 22nd. I have since revised this goal to be only shooting 100 or worst once this season. So there is a brief recap of my season at the midway point. 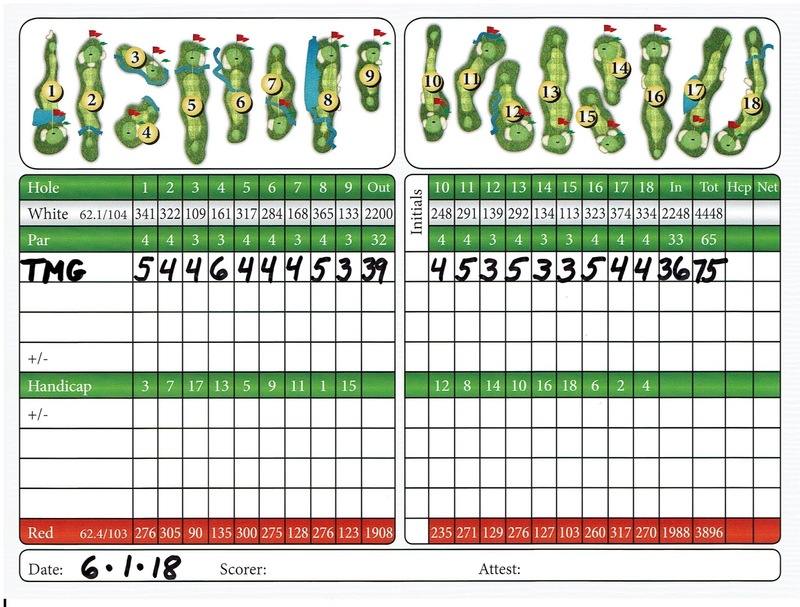 I have played some really good golf, shooting a personal best 75 at Fairways GC on June 1st; some consistent golf, with a four rounds in the low 90s; and one really bad round of golf, the aforementioned 100 at Fairways GC. Overall, I would grade myself a B- for the season so far, with an aim to get that to B+ or better by the end. Hoping to bounce back from the mental meltdown I experienced the previous week at the Fairways Golf Club, I teed it up at the course again this past week. In hoping to change my score, I made several changes to my bag for this round: I replaced my Wilson Staff Driver and Golfsmith 5-Wood for a Callaway Big Bertha Alpha 815 Driver and X Hot 7-Wood, respectively, as well as subbing a 56-degree Solus sand wedge for the Wilson Staff 58-degree wedge I had been carrying. I also went back to a Titleist NXT ball from the Pro V1 I had struggled with the prior round. 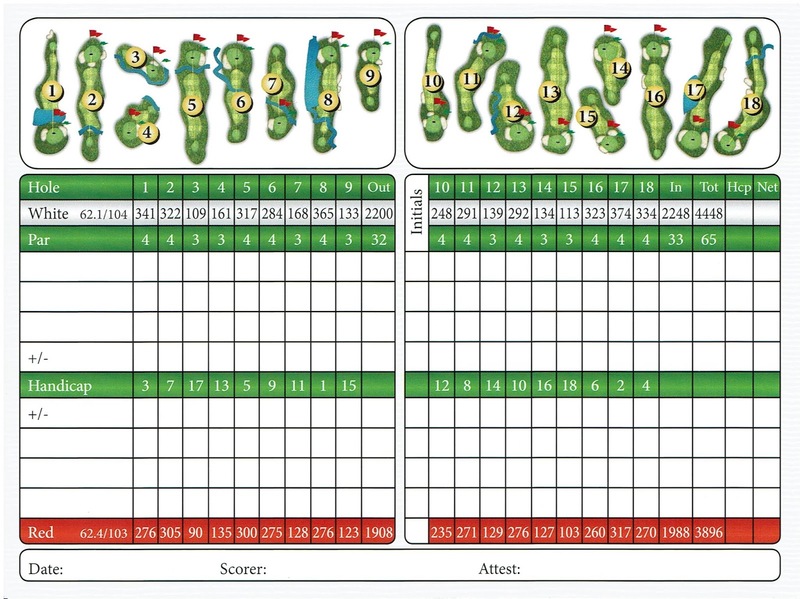 These changes seemed to have little impact on the front nine, as I made an 8, 3 7s and a 6 in shooting a 49--one stroke worse than the front nine the week before. I did, however, manage to make par at two of the four Par 3s on the front nine. I also discovered that my swing was getting more around my body instead to more up-and-down. Standing on the Tenth tee, I kept one swing thought: swing more up-and-down. I also was determined to have a better mental focus than I had the previous. 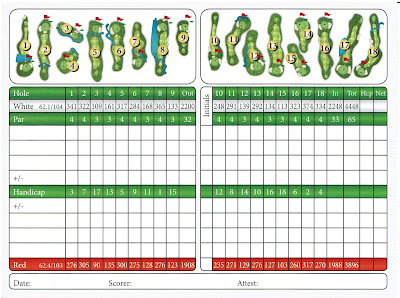 It resulted in a back nine 42, which is certainly better than the previous round, but still not good enough. I did make two pars and had par putts on five of the other seven holes. If my putting had been a little better, I could have easily shot in the 80s, instead of the 91 I posted. Overall, I played better than the previous round, but I am still searching for the consistency I had earlier. I think the discovery about my swing plane could help, as will the change in equipment. But I need to get back the short game and putting that helped me open the season so well. Moving forward, the Callaway clubs will stay in the bag and I will also replace the Golfsmith XPC Plus 3-Wood with a Callaway X Hot2 4-Wood. The Solus sand wedge will be replaced by a new Wilson Staff 56-degree FG Tour PMP 56-degree wedge. And my Odyssey #9 will be removed in favor of another Odyssey putter, an original Rossie II. These changes will be tested this coming Sunday when I tee it up at a new course in Delaware: Mulligan's Pointe in Georgetown.